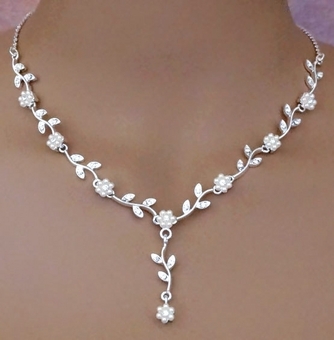 This delicate bridal jewelry set design has small faux pearl and rhinestone flowers connected with 'leaves' for a beautiful and popular look. The necklace measures 16 inches long, and the earrings are 1 inch long. If you want a winning but delicate design for your bridal party, pageant or prom, this is it. We have carried this wedding jewelry design for years, and it has always been one of the most popular. It also has titanium earring posts for your comfort.